Since the departure of Lucas Leiva to Lazio back in 2017, Liverpool have noticeably lacked an effective defensive midfielder to protect the back four and mop up any impending danger, but Jurgen Klopp looks to have amended that issue. The Reds splashed out an initial £39million, as reported by BBC Sport, on Monaco’s versatile midfielder Fabinho, who arrived at Anfield last summer as just one of a number of marquee arrivals along with Alisson Becker and Naby Keita. However, as we saw from Klopp with the likes of Alex Oxlade-Chamberlain and Andrew Robertson at the start of last season, the Brazil international was slowly bedded in, and was left out of the squad entirely on a number of occasions as he was allowed to acclimatise at his own pace. It wasn’t until 20th October that the 25-year-old made his first Premier League appearance for Liverpool, coming on as a substitute in the 1-0 win over Huddersfield, before making his first start for the club a week later in a 4-1 win over Cardiff at Anfield. Since then, the one-time Real Madrid man has been a constant feature in Klopp’s team selections, and has also been a huge factor behind their stunning form which has them sat four points above Manchester City at the top of the league. 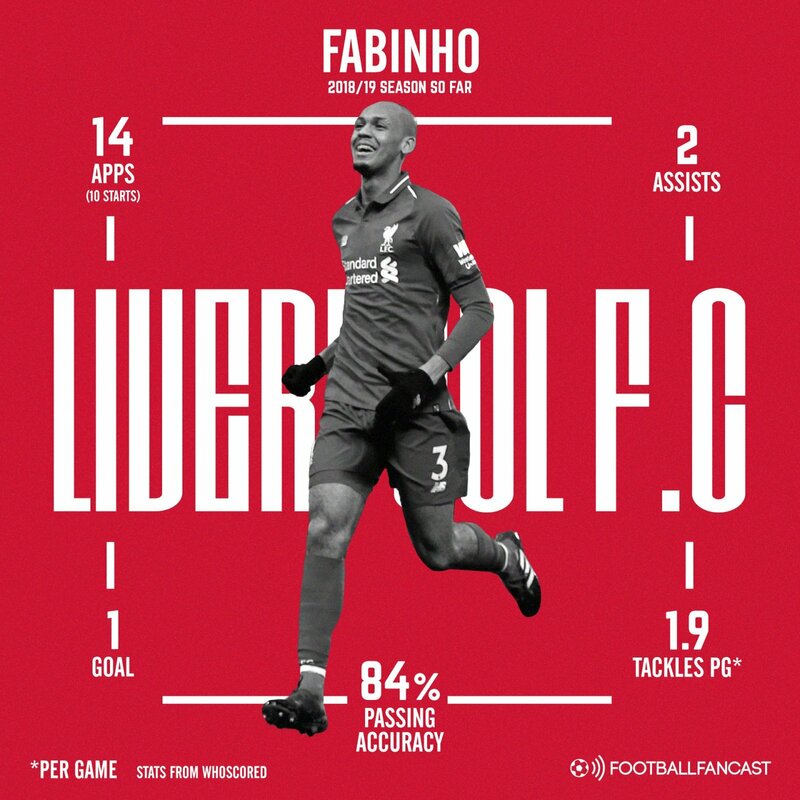 Fabinho is doing what Leiva used to do and multiplying it by 10, as he has emerged as one of the Merseyside club’s most important players in such a short space of time. Since his league debut, the 6 foot 2 summer signing has recorded consistently high Whoscored ratings for his efforts, with the 3-1 victory over Manchester United at Anfield standing out as his best performance and perhaps one of the best performances from any player in England’s top-flight this season – Fabinho absolutely ran the show, recording an assist and controlling the midfield. His role in front of the Liverpool backline is hugely significant in allowing the flair players up top, such as Mohamed Salah, Sadio Mane and Roberto Firmino, to perform to their maximum – it must be noted that he is far from being a big, defensive lump like many of his enforcer peers. Fabinho displays fantastic composure and technique on the ball to contribute to the attack, along with an unerring ability to steal possession from the opposition and intercept their attempts to break down the defence. Additionally, with Liverpool suffering a number of injuries in defence, Fabinho has also been able to slot in at centre-back alongside Virgil van Dijk with ease, whilst he can also play at right-back if needed. In the current market, and with his best years ahead of him, signing Fabinho for just £39m should be considered a snip by the recruitment team at Anfield. He is proving a revelation for this Reds side, having the same sort of effect on the team as title-winning midfielders Fernandinho and N’Golo Kante have previously had for Manchester City and Chelsea respectively.